DeLorean Motor Company (DeLorean) was an American automobile brand started by a former top GM excecutive, John Z De Lorean, in 1975. DeLorean cars were known for the futuristic looking linear design, hard edges, wedge shape and unpainted body panels made from brushed stainless steel sheats. The prototype work started in the early 1970s and the body with its gull-wing doors was designed by Giorgetto Giugiaro at Ital Design and was finished in August 1975. The vision was to have an eco-friendly, rust proof, $12,000, low volume, 20 year lasting, high quality safety sports car weighing 1000 kg/2200 lbs and achieving 20 mpg city/30 mpg highway. The first prototype was finished in October 1976 and had a mid-mounted Citroen Wankel engine. The second prototype, 10 months later, had the rear mounted PRV (Peugeot, Renault & Volvo) V6 engine that was used in production. Part of the $217 million capital for the company were generated by having the dealers, 344 in all, investing $25,000 in stocks each and by placing the factory in a country with large unemployment were the government were willing to contribute funds through tax remissions, loans and grants in order to generate about 2000 jobs. Different locations like Ireland, Puerto Rico and Texas were in the works, but the factory ended up in Belfast, Northern Ireland, an area where 1 in 3 were unemployed and sectarian violence were prominent. 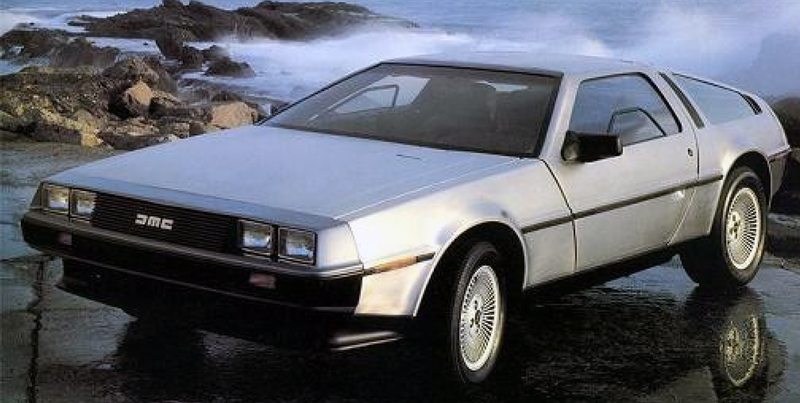 DeLorean was able to recruit high end staff from Chrysler and GM, among them Bill Collins and Eugene Dafiero. The chassis were designed by Lotus Cars in England and were based on the Lotus Esprit. Existing parts from other manufacturers were used to speed up development and to get the production line rolling. Among them brakes from Ford Cortina, interior parts from Volkswagen and the PRV, 2.85 liter aluminum 90° V6 engine with single overhead cams that generated 130 hp. The work on the production factory started in October 1978 and 600 workers started in December 1980 to assemble the first cars on the assembly line in January 1981. The first batch of cars shipped to USA had to be reassembled in California due to low quality, but quality and fit and finish improved at the factory that had 2600 workers at the most. 8583 DeLorean's were produced in 1981-82 and sold as 1981, -82 and -83 model year cars. DeLorean's ended up costing $25,600, Porsche 911 territory and roughly twice the price envisioned, used a steel frame with reinforced plastic floorpan instead of all reinforced plastic (ERM) structure, weighed 2840 lbs and accelerated from 0-60 in 10 seconds, 2-3 seconds slower than the competition. Due to lower sales than anticipated DeLorean's North Ireland plant went into receivership in February 1982 and US operations went into financial hardship later in the same year.